I do love fish - well I should, it's my job - but I love feeding the family fish. I have been doing a salmon pesto recipe for a wee while - I can't even remember where I found the recipe. Oh yes I do, I think it's in Delia's 'How to Cook Vol 2' - my favourite cook book in all the world. But inspired by our Fish is the Dish work, I decided I needed to find a twist. Take 2 salmon fillets, tomato pesto, a good handful of breadcrumbs, a good handful of parmesan cheese and a sprinkling of magic (more of that to come)..... And there you have it, salmon with a twist. What did I do??.... It's so easy. I put the oven on to gas mark 6 and put some bacofoil on a tray. I laid the salmon out and covered it in tomato pesto. I mixed the breadcrumbs with the parmesan added a bit of pepper and gave a good mix with my fingers. I then squashed this down on the salmon and prepared my potatoes and mange tout. I then brought out my magic ingredient. 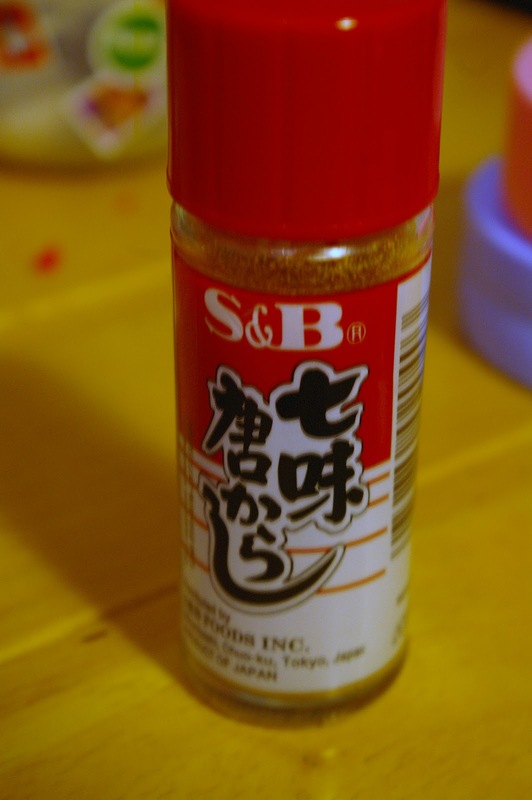 Japanese chilli powder. Wow this stuff is great. We use it in miso soup to give it a kick and I thought it might work. Into the oven for about 18 minutes or so (our salmon was beautifully thick so it was def 18 and not 15). Him indoors loved the kick from the chilli - this seems to be a bit more rounded in flavour than just yer bog standard chilli powder and is more flaky than powder-y. All in all, it was a gorgeous way to serve a rather elegant fish. Simply, stunning flavours. Him indoors liked it so much he has requested it again. Not quite spooky but it certainly sent shivers down my spine !!! Sounds lovely - salmon in pesto and breadcrumbs is delicious! Have you tried salmon or tuna marinated in chilli, soy sauce, sake and mirin? There's a fantastic recipe for that in the Good Housekeeping cookbook. A great slant on a salmon recipe, where can you buy the Japanese chilli powder from? How is it different to normal chilli powder? The Museum of Flight - a family day out. Fish for tea with no prep. Honest.